John Mueller, Google's Search Trends Analyst said something meme worthy the other day in a Google webmaster hangout. 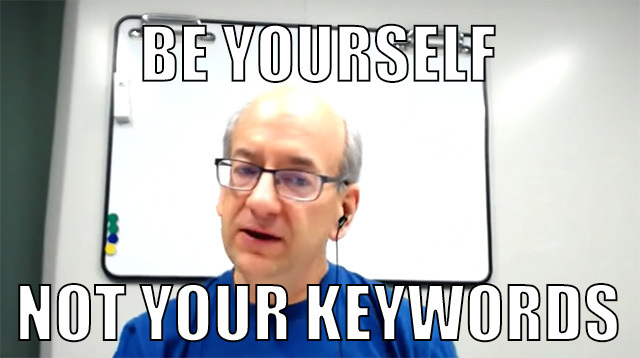 At the 9:07 mark into the video, he answered a question around keyword rich domains and said "be yourself and not your keywords" when giving advice around using keyword rich domains or not. So I had to make it into a meme - because it was a good line. He went on to explain that if you go with a domain name such as www.we-sell-big-yellow-pineapple-chairs.com and then all of a sudden you start to sell big blue pineapple chairs - then you got an issue. Do you have to change your domain name to something else? It always reminds me of the company named "A Place for Mom," and in all their radio commercials they have to say over and over again, they also have a place for your dad.